Geofire has been awarded a 10-year agreement to supply and install its Salamander range of fire door holders and closers into one of the largest hospital trusts in the UK. The agreement will see the trusted system installed across the estate to legally hold open fire doors, closing the doors in the event of a fire to protect residents and staff. Geofire was one of two companies in the industry to have its products put to the test by the trust’s Fire Safety Officer. After careful consideration, the radio controlled Salamander products were voted unanimously as the best/most appropriate by the trust’s expert panel. Each Salamander device connects wirelessly to a mains-powered controller unit, which is easily connected to the existing fire alarm system. The system is suitable for a BS7273-4 critical actuation (category A) installation to ensure that fire doors will safely close in the event of a fault or fire. 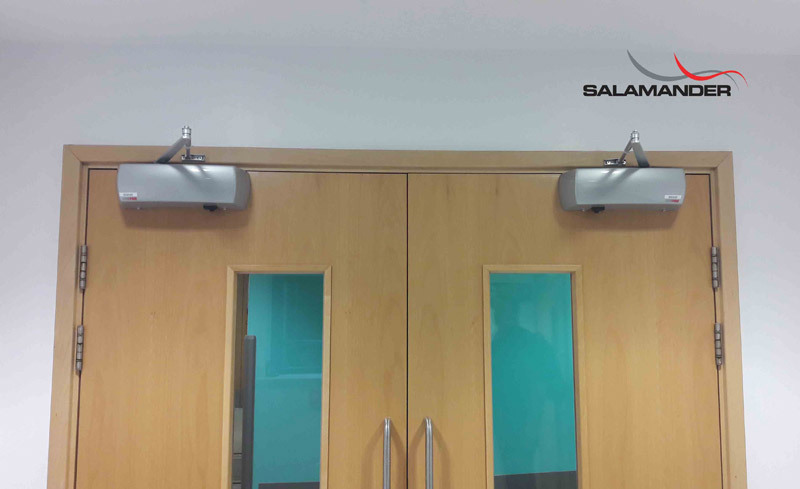 One controller unit can manage up to 99 fire door closers or fire door holders. Geofire’s Salamander range of radio controlled fire door safety products are all battery-powered and wire-free, thus saving time, installation costs and disruption to a building’s fabric or occupants. Both the fire door holder and closer are fitted to the top of the door ensuring a hygienic installation and minimising damage to the units. 18th Edition: How Are Cable Supports Changing?